The Mercedes-Benz S-Class is an icon for the Mercedes brand and serves as the benchmark by which all other large luxury sedans are measured. The model range is vast with the S550 V8 model priced under $90,000 on the lower end and the exclusive V12 S600 and S65 AMG models priced in excess of $140,000 on the upper end. The S-Class is a handsomely styled vehicle with a complex combination of smooth and angular surfaces. Prominent wheel arches make the new S-Class appear more muscular than its predecessor. Interior trim materials include wood, chrome, leather, and aluminum. The S-Class uses the COMAND system to manage secondary controls via a multi-function LCD panel, and a center console-mounted rotary "mouse". All S-Class sedans feature a standard navigation system. Audio is provided by a harman/kardon LOGIC 7 system with 600-watts and 14-speakers. Navigation, audio, and telephone systems can be voice-controlled via the COMAND interface. As expected, the new S-Class is packed with new safety features. Examples include a radar-based Distronic-Plus cruise control, and active infrared night vision system. The PRE-SAFE system activates the passive and active safety systems if it determines a collision is imminent. There is no doubt that the ninth-generation S-Class will continue to please its loyal customers. What is more uncertain is if new buyers will be swayed instead by the more sporty BMW 7-Series, the understated style of the Audi A8, or the utterly reliable reputation of the Lexus LS 460. With a huge price spread, the S-Class also draws newer more exclusive competitors like the Maserati Quattroporte and Bentley Flying Spur. 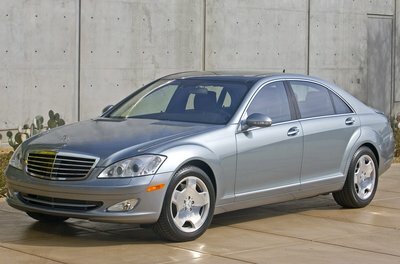 An all-new ninth-generation S-Class bows for 2007. The model range starts with the S550 which is powered a new 5.5L V-8 producing 382-bhp/391 lb.-ft. This new engine finally has DOHC 4-valve heads and variable valve timing, unlike the SOHC 3-valve head V-8 engine in the previous generation car. The V8 is mated to a 7-speed automatic. At the upper end, the S600 and S65 AMG models feature V12 power trains with 5-speed automatic transmissions. The new styling features more angular and taut surfaces than its predecessor does and the overall effect is vaguely reminiscent of the Maybach sedans. A redesigned interior now has increased shoulder and elbow room and a host of new electronic features.